3 bedroom 3 full baths, 1 half bathroom, sleeps a maximum of 10 guests 6 psgr Golf Cart included. Property Size 2,150 sq. ft. 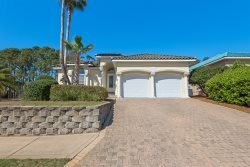 Private Gated Upscale Beach Community with Clubhouse – luxury abounds. All the comforts of home with quality furnishings and the taste of elegance await you at Grand Palms Villa. Plus your own private pool with hot tub. A fun and convenient 6-seater street legal golf cart is included in the rental for trips to the beach. Enjoy Margaritas in your screened-in covered patio/pool area in this luxurious backyard setting. Two huge slider doors make your outdoors become part of your indoors. Dining area seating for 9. Snap hundreds of family photo memories and perfect your grilling technique on the stainless steel BBQ. Your master suite includes a separate entrance to the pool and hot tub for late night dips (when no one’s looking). Each bedroom has its own full bathroom and the Master Bath has large jetted tub and double vanities. Resort facilities include Olympic-sized pool, Hot Tub, Weight Room, Movie Theater, Children’s Play Yard and Tennis Court. Wrist bands are required to use facilities and can be purchased for a fee..
Rates are based on 8 guests, additional guests over 8 to a maximum of 10 is $105.00/wk per person plus taxes. Children under age 2 are not included in the guest count. Check in 4:00PM Check out 10:00AM. Parking for 3 cars (2 cars in driveway, 1 in garage) Absolutely no parking on the street. The team at Easy Street was terrific to work with, before, during and after our stay. Always friendly and always available to help or to answer questions. Our week at Grand Palms Villa was great. Very relaxing with plenty to do at the house with the pool and hot tub, but plenty of attractions and entertainment nearby. Id recommend to anyone. Debbie and Rick provided this lovely home when we were evacuated from St. Petersburg during Hurricane Irma. There were no hotels available in Florida or Georgia and lucky for us Easy Street had a last minute cancellation that could accommodate our group of seven and two dogs! We stayed for four nights with all the comforts of home! Staying at Grand Palms was truly a life saver. Team was very attentive to details and assisted us with every need we had of them. We will definitely use them again. Property was excellent. We loved every part of the property. Very well kept and maintained. We thoroughly enjoyed our stay there. Had a wonderful time. Very helpful and friendly. We had a fantastic time at Grand Palm Villa! We loved the screened in pool and lanai, the great room, kitchen were great! Loved the golf cart!!! We are so pleased with our stay, we are planning next years visit at the same house. Thank you for an amazing Thanksgiving at the beach. We were sad to leave. Nice Place in plush Destiny East, Close to the Beach We rented this place for a week in August, 2015. We have 3 kids (10,8,2) and traveled with another family and their 2 kids (13,10). The house was very nice and had all the amenities we wanted. The kids enjoyed the small pool area and took a dip in it daily. We love the Destiny East gated community, clubhouse and community pool. The beach is 2 minutes away and the 6 seat golf cart makes trips to and from easy. We would recommend the house to any of friends looking for a slightly upscale house that gives you more privacy than a resort or condo. We have rented from easy street many times and have always been pleased with your team. This was our second year staying at this property and we love it. It suits everyone's needs, from our 2yr. grandson to oldest of the group. The pool is such a wonderful asset especially with the children. Rick and his team are always very accommodating and friendly. I would (and have) recommended this property to anyone who is looking for a great location, completely and beautiful property including the club house and community pool and play area. Last but certainly not least, the golf cart is so convenient and fun, especially for getting around the area and not having to crank up the car. Thank you for another successful family vacation. See you next year.......maybe at a larger property! We loved staying in this home. We had it for two weeks. One with two other couples and one with our children and grandchildren. It was perfect! Will definitely be returning guest. Pool area was great for the grandchildren, 10, 6 and 15 months. Golf cart was a great added amenity. Owner was super nice and accommodating. Thanks for a great vacation home!! !